The life of Neil Armstrong, the engineer, the pilot, the astronaut, the first man to walk on the moon, the family member and friend, was celebrated Thursday (Sept. 13) during a public memorial service at Washington National Cathedral. "How does one adequately express his feelings about a special friend when that friend is also a world icon, a national hero of unimaginable proportion and a legend whose name will live in history long after all here today have been forgotten?" posed Eugene Cernan in his tribute to Neil Armstrong, who he followed to the moon as the 12th and last American astronaut to stand on the lunar surface. Armstrong, 82, died Aug. 25 following complications that resulted from cardiovascular procedures. In July 1969, he spoke the instantly historic words, "That's one small step for (a) man, one giant leap for mankind" as he became the first human to walk on the moon. "Fate looked down kindly on us when she chose Neil to be the first to venture to another world and to have the opportunity to look back from space at the beauty of our own," Cernan said, choking up at times. "No one, but no one, no one would have accepted the responsibility of his remarkable accomplishment with more dignity and more grace than Neil Armstrong. He embodied all that is good and all that is great about America." 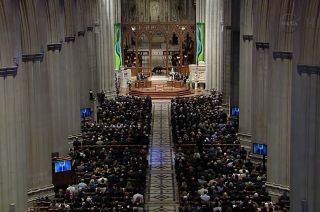 Thursday's memorial service in Washington, DC preceded Armstrong's burial at sea, to be conducted by the Navy on Friday. Details of his ocean interment were not released, though President Barack Obama ordered flags be flown at half-mast to mark the day of the ceremony. The national memorial service, for which a limited number of seats were reserved for the public to be able to attend, brought together dignitaries, political leaders, Armstrong's family and members of the NASA family — including the astronaut's Gemini and Apollo crewmates David Scott and Buzz Aldrin — to mourn the loss of the first moonwalker. Armstrong's Apollo 11 crewmate, Michael Collins, led the assembly in prayers. "Creator of the universe, your dominion extends through the immensity of space," Collins read, "guide and guard those who seek to fathom its mysteries. Especially we thank you this day for your servant Neil Armstrong, who with courage and humility first set foot upon the moon. Following his example, save us from arrogance, lest we forget that our achievements are grounded in you." In July 1974, Collins, Armstrong and Aldrin donated one of the moon rocks they brought back to Earth to the National Cathedral. A sliver of that same lunar sample is now on display there, embedded in a stained glass window that pays tribute to their historic moon landing. In between the tributes and readings, including remarks delivered by former Secretary of the Treasury John Snow and a biblical passage read by former Secretary of the Navy John Dalton, musicians dedicated performances to the late Armstrong. Canadian jazz pianist Diana Krall sang an emotional rendition of "Fly Me to the Moon," as was originally arranged by Frank Sinatra. The Metropolitan Opera Brass, the U.S. Navy Band "Sea Chanters," and the Cathedral Choristers also performed pieces, including "America the Beautiful." The ceremony came to a close with Bolden presenting an American flag to Carol Armstrong, the astronaut's widow. The U.S. flag was flown over the Mission Control Center at NASA's Johnson Space Center in Houston on the day of Armstrong's passing. "Neil Armstrong left more than footprints and a flag on the moon," Bolden said." In fact, as President Obama said in a letter to Carol [Armstrong] and the family this morning, 'future generations will draw inspiration from his spirit of discovery, humble composure and pioneering leadership in setting a bold new course for space exploration. The imprint he left on the surface of the moon and the story of human history is matched only by the extraordinary mark he left on the hearts of all Americans.'" For those unable to be there, NASA aired the memorial service live on its television channel as well as streamed it online through its website. Armstrong's family earlier gathered for a private service on Aug. 31 in Cincinnati, Ohio. The family also established the "Neil Armstrong New Frontiers Initiative," a memorial fund for the Cincinnati Children's Hospital Medical Center. They have asked that memorials be made to the Initiative, or to two scholarship funds setup in Armstrong's name by the Telluride Foundation and by the American Institute of Aeronautics and Astronautics (AIAA). The family also suggested for those wishing to pay tribute, that they "honor his example of service, accomplishment and modesty, and the next time you walk outside on a clear night and see the moon smiling down at you, think of Neil Armstrong and give him a wink."